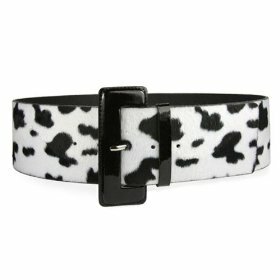 This fashion belt features cow print animal fur straight strap with patent self covered buckle and will be the best accessory to punch a solid color outfit! The size chart does not include buckle length. There are total of five holes, 1″ apart. 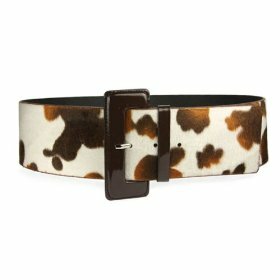 It is recommended to select size from buckle fold to center hole that better matches measurement of your waist or where you wear this belt. It would be more comfortable to measure where you will wear the belt, add 1-2″, and then pick the size where this number falls.